Ottawa, Kent, and Ionia counties contract with a private for-profit vendor for "road kill" clean-up. OTTAWA COUNTY-Public-private partnerships, which often include outsourcing between private, for-profit enterprises and government have operated successfully for decades. Partnerships can be found in all areas municipalities operate: water and wastewater treatment, mental-health services, and foster-care services, just to name a few. It's always nice to discover such partnerships serving the cause of environmental health and safety and the most recent example comes from Ottawa County. 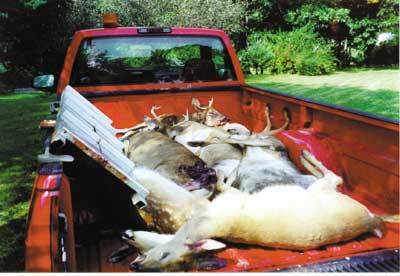 Approximately 500 deer are killed on Ottawa County roads each year. It costs approximately $100 for the Ottawa County Road Commission to remove each one, which means an annual cost of $50,000. That is one reason the county turned to a private vendor. The grizzly duty is now handled by Rich Conner and his grandson Brandon, who drive around Ottawa, Ionia and Kent Counties every day picking up deer that have been killed by passing vehicles. The Connors fee is only $39 per deer. The resulting 61 percent savings come to $30,500 per year; savings that can be used make our roads safer. "They do it very economically," Ottawa County Road Commission engineer Mike Close told the Holland Sentinel. "We just can't compete. We're economically set up to plow snow." What impact might privatization have on the impact of government-sponsored environmental and health and safety measures if the government could fire vendors when they don't do a good job?